Although MIT's annual Spring Weekend is geared toward entertainment and relaxation, it also benefits several charities, including one founded by MIT students. Spring Weekend '94 began last night with Mr. Spring Weekend, sponsored by the Women's Independent Living Group. Five contestants competed in the categories of original dress, talent, question-and-answer, and persuasiveness in soliciting money from the audience. This year's winner, David C. Cho '94, chose the AIDS Action Committee as his charity, "inspired by Jacob White, because he didn't win Big Screw, and I'm taking 6.003." Today, the International Fair will feature many different booths selling ethnic foods and presenting international dances and songs. The fair, sponsored by the International Students Association, is located in front of the Student Center. Tonight, Alpha Tau Omega, the Interfraternity Council, and the Undergraduate Association are holding Las Vegas Night. Money raised from ticket sales will go to Childhelp USA, a charity organization that fights child abuse, according to Michael H. Joo '95. At the same time, the UA Social Council's Karoke Pub Night will feature a 10-foot video screen and video disc jockeys. "It's kind of like a Strat's Rat, except the students are the entertainers," said UA Social Chair Rahul A. Saha '94. Tomorrow, Sigma Chi will host the Spring Intercollegiate Greek Shootout, a basketball tournament between members of fraternities and sororities of MIT, Tufts University, Boston University, and Northeastern University. Proceeds will benefit the Genesis Fund, a charity that helps children with birth defects. Alpha Phi's "Alpha Phlea Market" will raise money for the American Heart Foundation. Participants will perform short acts on the Student Center steps, then auction services such as free tutoring, chauffeuring, or laundry service, to the audience members. East Campus's spring picnic tomorrow afternoon will feature several bands: Famous People, the Herman Johnson Quintet, and Good Rain. The food and music are scheduled to last until 9 p.m. this year, since "[the picnic] was going pretty strongly up till 8:30 last year," said Daniel D. Hurda '95, East Campus social chair. As the day draws to a close, Sigma Iota Phi will host "A Night at the Improv" at Lobdell, featuring MIT's improvisational comedy group Roadkill Buffet, as well as groups from Wellesley, Tufts, Bowdoin, Brandeis, and Emerson. At the same time, the Student Center Committee will hold its annual spring concert in Johnson Athletic Center, featuring Belly with Cold Water Flat. 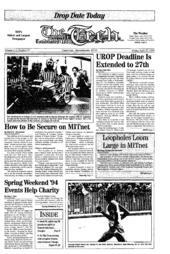 Spring Weekend '94 ends with the "Sundae Sunday" bash in Kresge Oval, hosted by the class councils. Funds raised at Las Vegas Night will benefit Project America, a non-profit organization founded in 1991 by Danielle C. Goodman '95, Joo, Jorey E. Ramer '95, and three students at University of Pennsylvania. Project America began as an effort to coordinate a national community improvement day, Joo said. It is now sponsored by over 200 national organizations and corporations and several U.S. Senators and mayors. "We wanted the casino night to be the kickoff for Project America, to raise funds and awareness, starting here, since it was founded by MIT students," Joo said. In May, Project America will start a major media campaign to "spread the word, city by city," Joo said. Advertising companies have donated money for Project America advertisements in Time and Newsweek magazines, and Project America's founders hope to begin an annual nationwide community service day scheduled for Oct. 15, 1994. The UA donated the $4,000 necessary for the Casino Night equipment, and over $5,000 in prizes, donated by local retailers, will be raffled there. Prizes include a futon, gift certificates from record stores and restaurants, two Stanley Kaplan test review courses, 1,000 Club Europa tickets, and a weekend at the Marriott Hotels, Resorts, and Suites.